At first I wasn’t as in love with these giant, baked pancakes as I am the griddle-made ones, but this dish is seriously growing on me. Super-simple, and the leftovers keep better than traditional pancakes, too! You know how regular pancakes tend to get soggy when reheated in the microwave? Especially if you add syrup? Well not these bad girls! 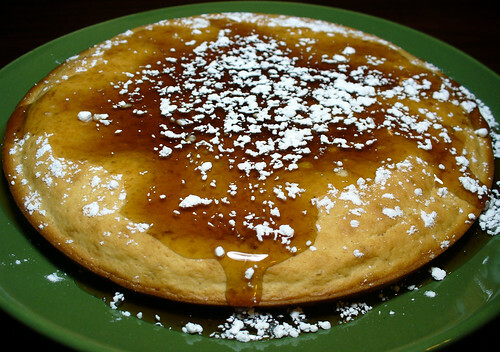 They soak up syrup like a sponge while still retaining their fluffy, pancake-y texture. Powerpuff pancakes, these are! Also, they will make your house stink of pumpkin spice. In a good way! 2. Spray two 9″ round cake pans with cooking spray and pour equal amounts of batter into each pan. Bake at 425 degrees F for 20 minutes or until golden brown. Remove the pancakes from the pan and serve immediately! This entry was posted on Wednesday, January 4th, 2012 at 2:35 pm. You can follow any responses to this entry through the RSS 2.0 feed. You can leave a response, or trackback from your own site.